The University of Maine at Presque Isle is pleased to announce that it will be bringing Camp Invention—the nation’s premier summer enrichment day camp program supported by the National Inventors Hall of Fame and the United States Patent and Trademark Office—to campus the week of August 3 to 7. The weeklong day camp for students entering grades one through six fosters innovation and creativity while also building self-esteem, teamwork, persistence, and goal-setting skills. As part of this unique camp that encourages inventive young minds through Science, Technology, Engineering and Mathematics (STEM), participants will design and build their own inventions, take apart gadgets, get creative and messy, and have a whole lot of fun in the process. This special program is being led by Camp Director Elaine Hendrickson, the 2001 Maine Teacher of the Year, and features local educators Carson Dobrin and Audra Kirk as instructors. Assisting the instructors and participants as Leadership Interns are Liam Daniels, Emily Sjoberg, Alyssa Sweeney, and Sarah Morneault. Activities on the agenda range from building and competing in a team freestyle racing cart to prototyping an epic video game level to taking apart old machines and inventing new ones. 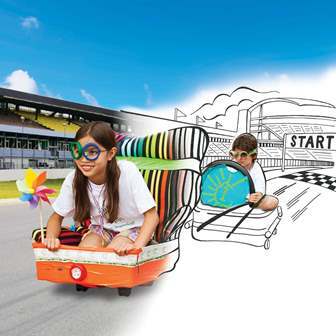 Camp Invention students experience winning, success and victory, along with an adrenaline rush that comes with competition among students and successful completion of challenging projects. The camp provides a great opportunity for kids to exercise their creativity and use their imagination in ways they don’t normally get to do: through real-world problem-solving challenges, they build things, take things apart, and explore different types of technology. Many times, the students are having so much fun, they don’t even realize they are learning and developing new skills. Camp Invention serves more than 87,000 students every year through more than 1,300 camps across the nation. For additional information, visit www.campinvention.org. Camp Invention at UMPI will take place August 3 to 7 from 9 a.m. to 3:30 p.m. each day. Cost is $230. More than 30 children are already signed up for the camp, but there are still a few seats left. For more information about Camp Invention at UMPI, please contact Mary Lawrence at mary.l.lawrence@maine.edu or 207-768-9502, or Hendrickson at elaine.hendrickson@gmail.com or 207-551-7706. Camp Invention is the only nationally recognized summer program focused on creativity, innovation, real-world problem solving and the spirit of invention. Through hands-on programming, Camp Invention encourages children in grades 1-6 to explore Science, Technology, Engineering and Mathematics curriculum inspired by some the world’s great inventors. Camp Invention, the National Inventors Hall of Fame and the Collegiate Inventors Competition serve as the authority on inspiring invention and compose Invent Now. This nationwide organization is committed to the curious minds and innovative spirits of the past, present and future. Since 1990, our education programs have served over 1 MILLION children and 125,000 teachers and Leadership Interns.